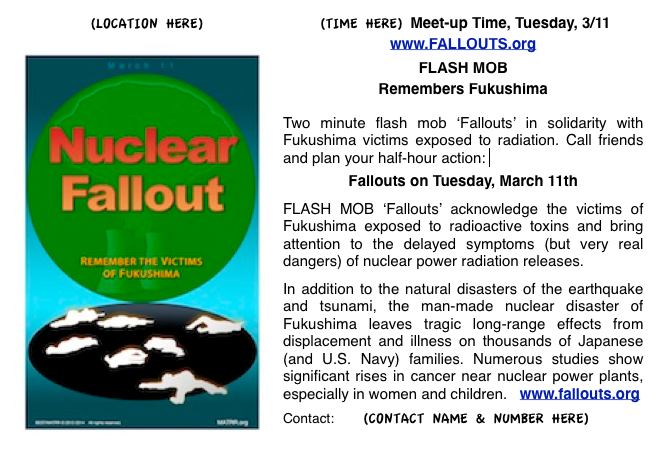 The idea for this event came from a powerful video of a series of flash mob ‘die-ins’ in May 2010, organized by Greenpeace Switzerland (see video below). As you can see in the 1½ minute video, the more people who participate, the more powerful the impact. 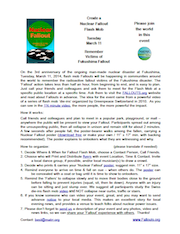 Call your friends and plan to meet at a specified time on March 11th in a popular park, playground, or mall – anywhere the public will be able to see your flash mob. Participants spread out among the pedestrians, then all collapse in unison and remain still for about 2 minutes. A few seconds after people fall, a poster-bearer walks among the fallen, carrying a Nuclear Fallout poster (download ours free or make your own), which explains to onlookers what they are witnessing and why. Read 'how-to' Fallout Guide. and solid cancers in 15 to 17 years"
"Fukushima and the Dangers of Nuclear Power"
On March 11, 2011, Japan suffered two horrific natural disasters – an unimaginably powerful 9.0 earthquake and a devastating tsunami that swept away countless homes, businesses, heirlooms, pets and 18,870 human souls. Japan also suffered a third, man-made disaster – causing terror and illness and 116,000 people forced to abandon their homes – perhaps forever. A 20 foot high tsunami defense wall had been built for the Fukushima Daiichi nuclear power plant; but in 2006, engineers warned the utility that the wall was not tall enough. 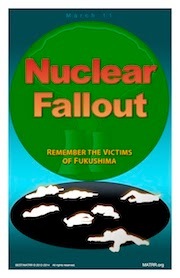 Unfortunately, Tepco did not raise the wall and the defense was breeched by a 32 foot tsunami that crippled the plant. Like all nuclear power plants, Fukushima Daiichi needed backup power to keep its nuclear reactors and cooling pools safe. Desperate attempts to prevent meltdowns were made, including dropping water from helicopters. Sadly, three explosions occurred at three reactors, killing three workers immediately and rendering an immense, once verdant area of Japan uninhabitable. The Japanese government declared early evacuation zones and 80,000 citizens became homeless due to nuclear power that day. A year and a half later, 116,000 Japanese citizens could not return to their Fukushima area homes, and had received very little compensation by the government or the utility company. 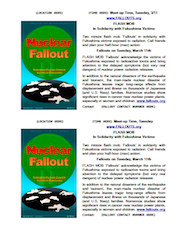 In an interview, "Fukushima and the Dangers of Nuclear Power" (see right column), leading expert Dr. Helen Caldicott says that Japanese doctors will begin seeing lung cancer and leukemia in 2 to 5 years, and solid cancers in 15 to 17 years, but that the contamination of the food chain will last for hundreds of thousands of years. Dr. Caldicott, M.D. is a former professor at Harvard Medical School, a pediatrician at Children's Hospital in Boston, Mass., and a current member of the International Scientific Advisory Board. Another expert in radiological health issues, Janette Sherman, MD, practicing toxicologist and research associate with the Radiation and Public Health Project, says "Radiation from nuclear reactor emissions is most toxic to the fetus and infant." It is important to realize that the vast majority of people are resistant to the formation of cancer cells and will not contract cancer themselves. However, the research shows that radiation can damage DNA and many different cells and organs. There is no safe dose, but some people are more resistant than others. The research shows us that women and children are more vulnerable, and that younger people are more vulnerable than older people (until advanced age deteriorates the immune system). 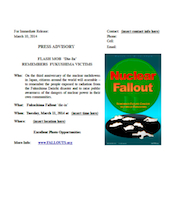 See our Radioactive Poisons page for more information. When the Fukushima Daiichi disaster happened, Japanese Prime Minister Naoto Kan forced the utility to not abandon the plant, but to stand and fight what he called "the invisible enemy." His actions prevented further meltdowns, and former Prime Minister Naoto Kan may go down in history as the man who saved Japan from nuclear annihilation. 'The Invisible Enemy' – but radiation does not have to be invisible. 1. Require bright visible DYE-MARKERS for all emergency radiation emissions. 2. Require PUBLIC HEALTH ALERTS whenever radiation is released into the environment. in REAL-TIME, not a year later as it is now. Please send a Letter to the NRC calling for these new regulations in the U.S., and advocate for them in your own country and community. Thank you for this and for all the good you do! CopyRight © 2012-2013 BEST / MATRR. All Rights Reserved. Watermark theme. Powered by Blogger.